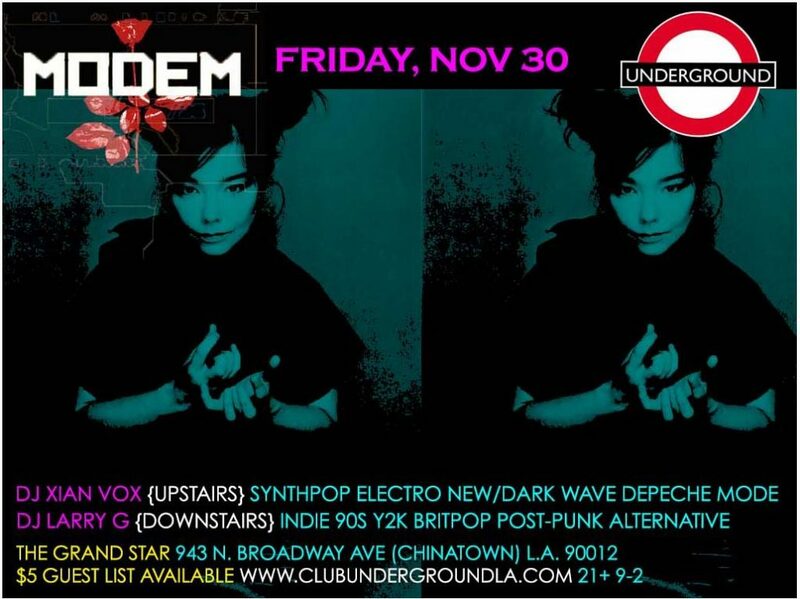 CLUB UNDERGROUND – Page 2 – EVERY FRIDAY – Indie, Brit Pop, New Wave, Post-Punk, Dark Wave, 80s, 90s, Y2K Dance Party! 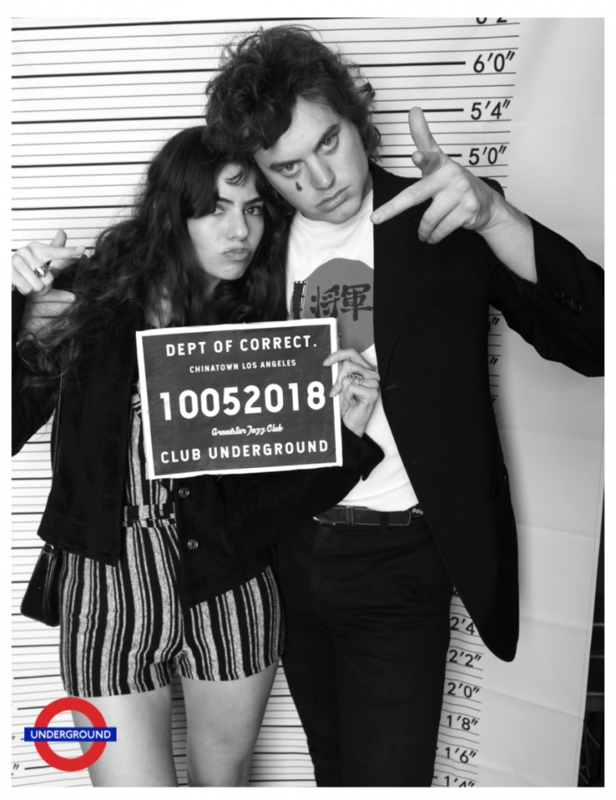 UNDERGROUND – NEW YEAR’S EVE BALL 2019 IN DTLA!! 2 FLOORS – COMPLIMENTARY CHAMPAGNE – RING IN 2019! Ladies and gentlemen, boys and girls…it’s that time of year! UNDERGROUND presents NEW YEAR’S EVE BALL 2019! Dance in the New Year with LA’s Cutest Crowd ringing in 2019. Light Up Dance Floor, Party Patio, Drink Specials, Giveaways, Champagne Toast (complimentary), Great Tunes & More! ► NEW YEARS EVE BALL 2019! 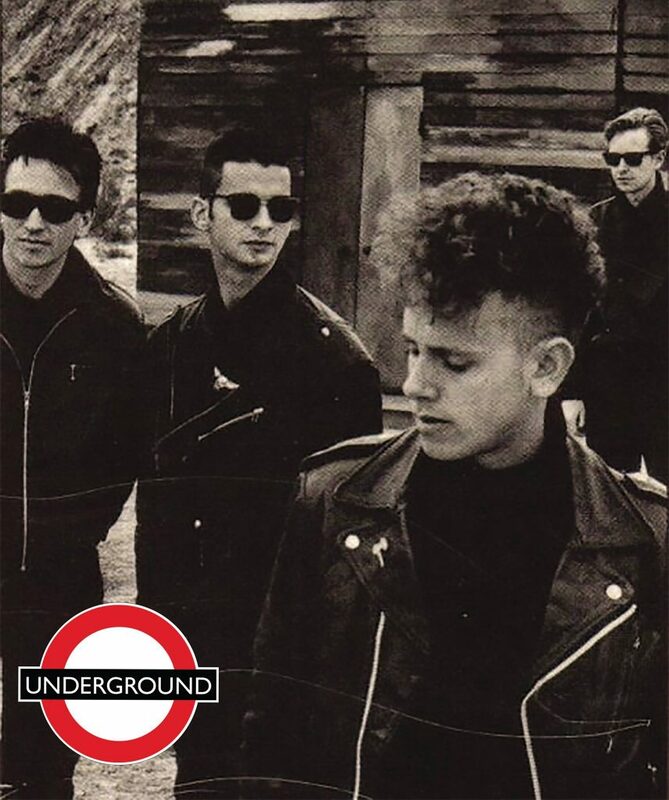 ► Indie, YK2, British Pop, Dark Wave, New Wave, Dark Indie, 80s, 90s & more! WEDNESDAY NIGHT NOV 21, IN DTLA!! $5 ENTRY ALL NIGHT WITH “Going” RSVP!! Club Underground presents BLITZ!! 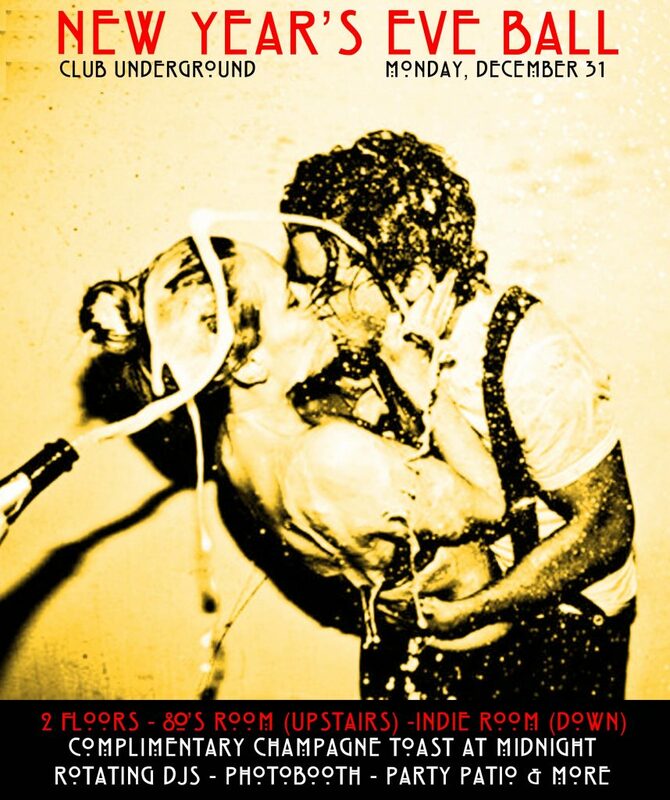 A dance party filled with the best Indie, YK2, British Pop, Dark Wave, New Wave, 80s, 90s & more! Underground invites you to head on down to Chinatown and join us for a night filled with fun, friends, great tunes & non stop dancing at The Grand Star Jazz Club located in the heart of Chinatown! As always, great tunes await and we can’t wait to see your smiling faces gracing our dance floor! The Smiths, Blur, Interpol, Crystal Castles, Joy Division, Bowie, Depeche Mode, Arctic Monkeys, Marvelettes, The Strokes, The Cure, Pulp, Yeah Yeah Yeahs, Duran Duran, Libertines, Amy Winehouse, New Order, Suede, Grimes, Gorillaz, Belle & Sebastian, Ladytron, Elastica, Talking Heads, Soft Cell, Phoenix, Daft Punk, Supremes, Gang of Four, LCD Soundsystem, T-Rex, The Jam, Pet Shop Boys, Devo, T-Rex, Cut Copy, Siouxsie & The Banshees, Saint Etienne, Blondie, Oasis, Bauhaus, Soft Moon, OMD, MGMT, Supergrass, Human League, The Horrors + the best from the 60s, 70s 80s, 90s Y2K & More! UNDERGROUND FRIDAYS! RSVP for $5 Cover! FRIDAY, YOU’VE GOT A DATE WITH THE NIGHT IN DTLA!! 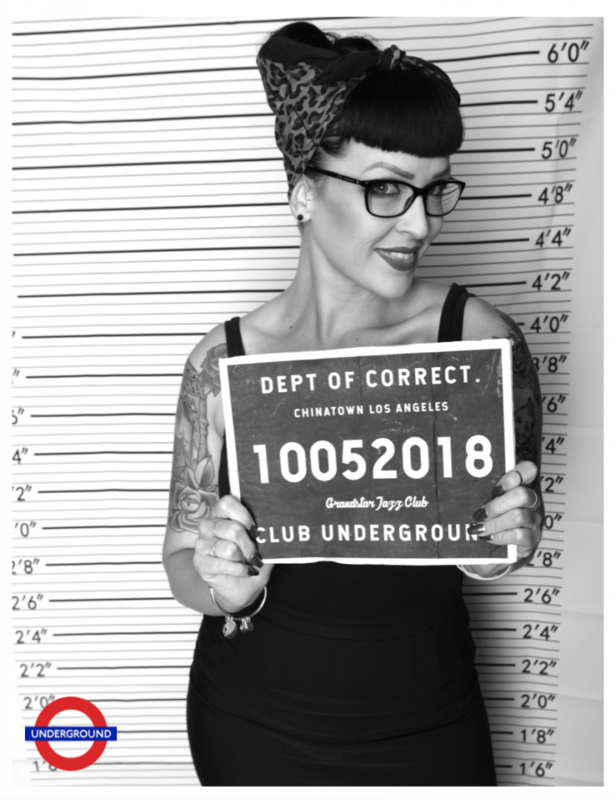 EVERY Friday, YOU’VE got a DATE with the NIGHT and with great music, a wonderful crowd and the DTLA gem that is CLUB UNDERGROUND! 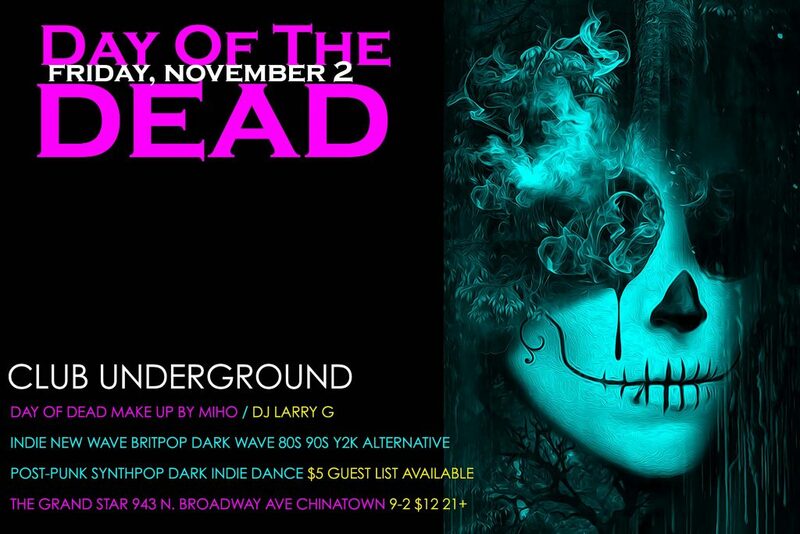 Underground invites you to head on down to Chinatown and join us for a night filled with fun, friends, great tunes & non stop dancing at The Grand Star Jazz Club located in the heart of Chinatown! As always, great tunes await and we can’t wait to see your smiling faces gracing our dance floor! The Smiths, Blur, Interpol, Crystal Castles, Joy Division, Bowie, Depeche Mode, Arctic Monkeys, Marvelettes, The Strokes, The Cure, Pulp, Yeah Yeah Yeahs, Duran Duran, Libertines, Amy Winehouse, New Order, Suede, Grimes, Gorillaz, Belle & Sebastian, Ladytron, Elastica, Talking Heads, Soft Cell, Daft Punk, Supremes, Gang of Four, T-Rex, The Jam, Pet Shop Boys, Devo, T-Rex, Cut Copy, Siouxsie & The Banshees, Saint Etienne, Blondie, Oasis, Bauhaus, OMD, Supergrass, Human League + the best 60s, 70s 80s, 90s Y2K & More! Got a birthday this week? Message us @ Club UNDERGROUND and we’ll hook you up with Champagne + Guest list!!! Ready for Dia De Los Muertos (Day Of The Dead)? 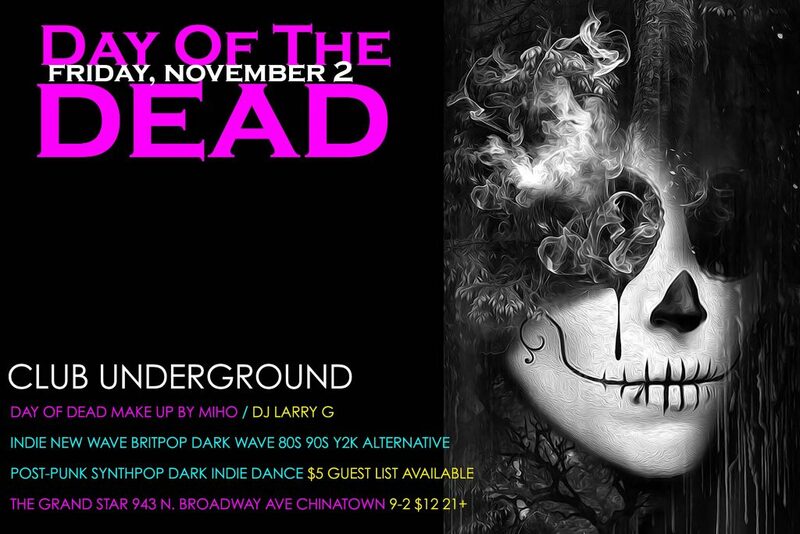 We are and will be celebrating with Day of Dead make-up artist Miho and building an Artist Altar for some of our favs that have passed on (think, Amy Winehouse, Ian Curtis, Kurt Cobain, Prince, David Bowie, etc) Friday, November 2nd, YOU’VE got a DATE with the NIGHT and the UNDEAD with great music, a wonderful crowd and the DTLA gem that is CLUB UNDERGROUND! Underground invites you to head on down to Chinatown and join us for a night filled with fun, friends, great tunes & non stop dancing at The Grand Star Jazz Club located in the heart of Chinatown! As always, great tunes await and we can’t wait to see your smiling faces gracing our dance floor! The Smiths, Blur, Interpol, Crystal Castles, Joy Division, Bowie, Depeche Mode, Arctic Monkeys, Marvelettes, The Strokes, The Cure, Pulp, Yeah Yeah Yeahs, Duran Duran, Libertines, Amy Winehouse, New Order, Suede, Grimes, Belle & Sebastian, Ladytron, Elastica, Talking Heads, Soft Cell, Daft Punk, Supremes, Gang of Four, T-Rex, The Jam, Pet Shop Boys, Devo, T-Rex, Cut Copy, Siouxsie & The Banshees, Saint Etienne, Blondie, Oasis, Bauhaus, OMD, Supergrass, Human League + the best 60s, 70s 80s, 90s Y2K, & More! 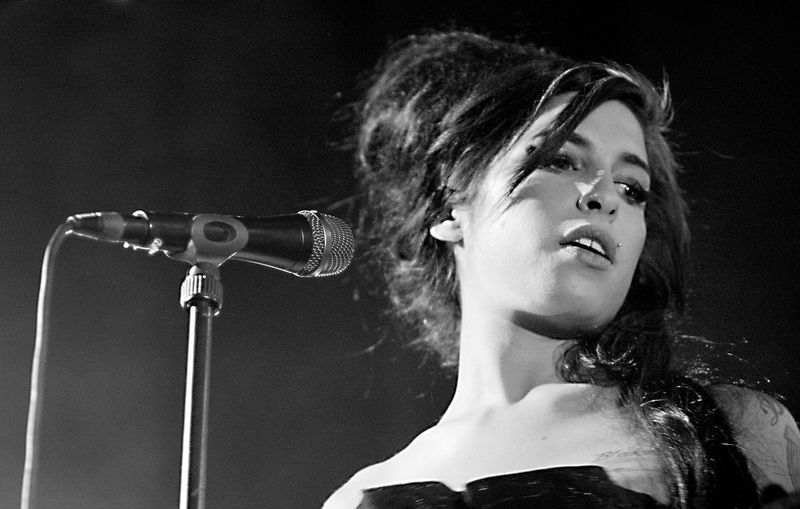 Morrissey & Joan Jett Ticket Giveaways! 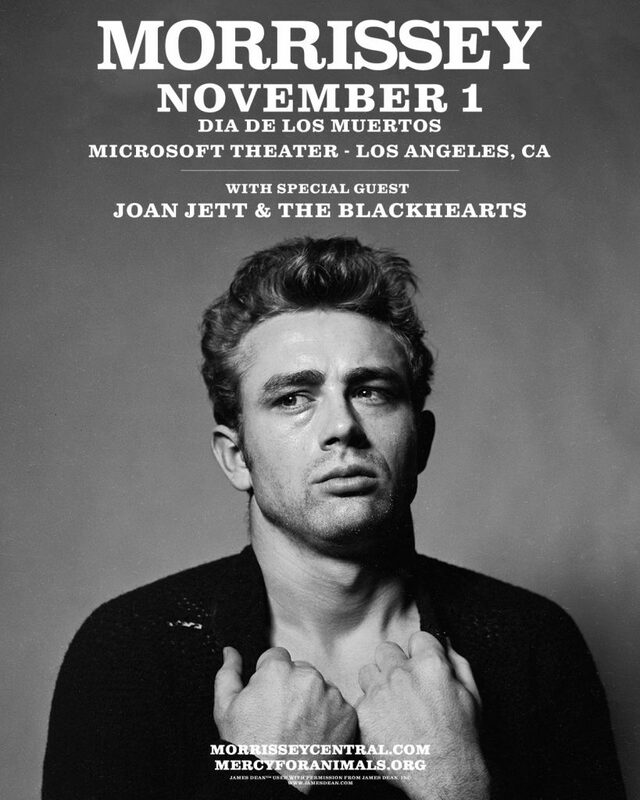 Win tickets to see the one and only Morrissey with special guest, Joan Jett & The Blackhearts. Underground & Goldenvoice will be giving away tickets online & at the next two events down at the Underground. Be sure to join/follow us for your chance to win and we will see you Friday! Tickets wont last long so be sure to book yours now, here! Of course Underground & Morrissey have a long history of record release parties and special events, done right, including a visit from the man himself. We look forward to the upcoming show and hope you can join us and Moz for his show on Nov 1st. 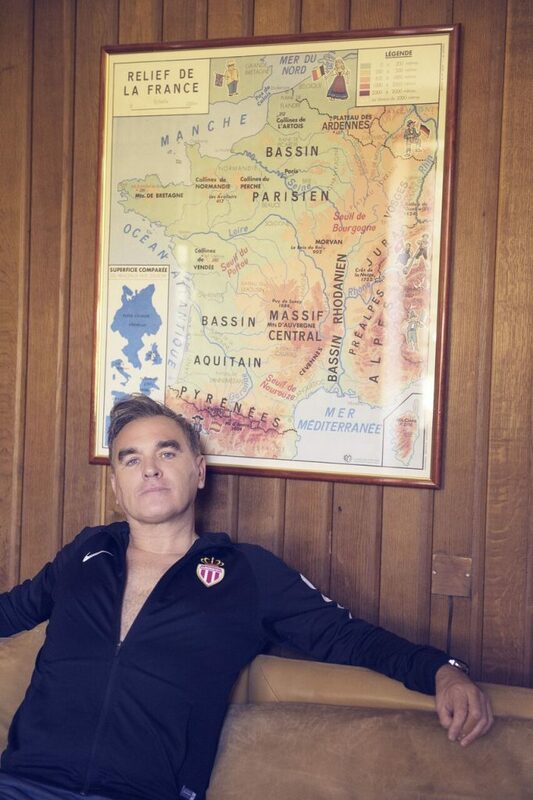 Win tickets for MORRISSEY this FRIDAY (OCT 19th) at UNDERGROUND! 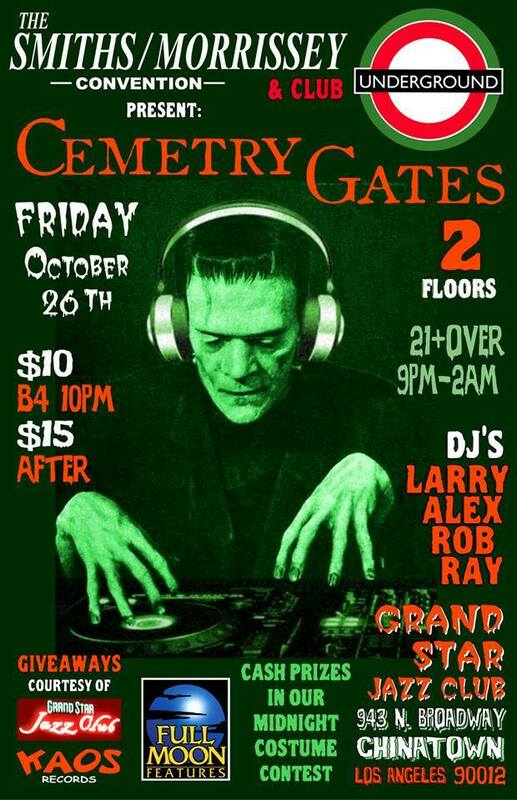 2 FLOORS + COSTUME CONTEST DJS & MORE! FRIDAY, October 26th join UNDERGROUND & THE SMITHS/MORRISSEY CONVENTION for the 5th Annual CEMETRY GATES Haunted Halloween Extravaganza!! 2 rooms of costumes, great tunes, dancing, photo booth, giveaways & fun! Costume contest with CASH prizes & GIVEAWAYS courtesy of The Grand Star, Smiths/Morrissey Convention & Underground-! Splash on extra eye-liner, tease your hair, lace up those Doc Martens and head on down to Chinatown and for a night filled with fun, friends, great tunes and drink specials. 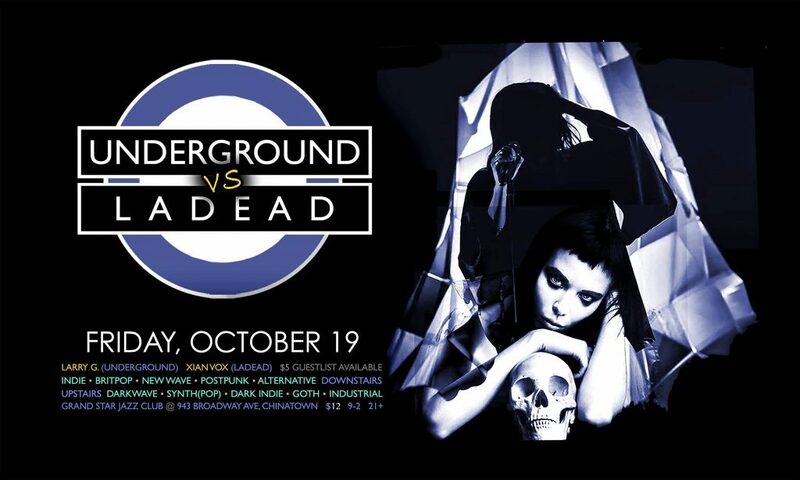 Club Underground Los Angeles & LADEAD are teaming up once again, and if you ever been to one these collaborative parties, you’ll know this isn’t an event to miss!!! 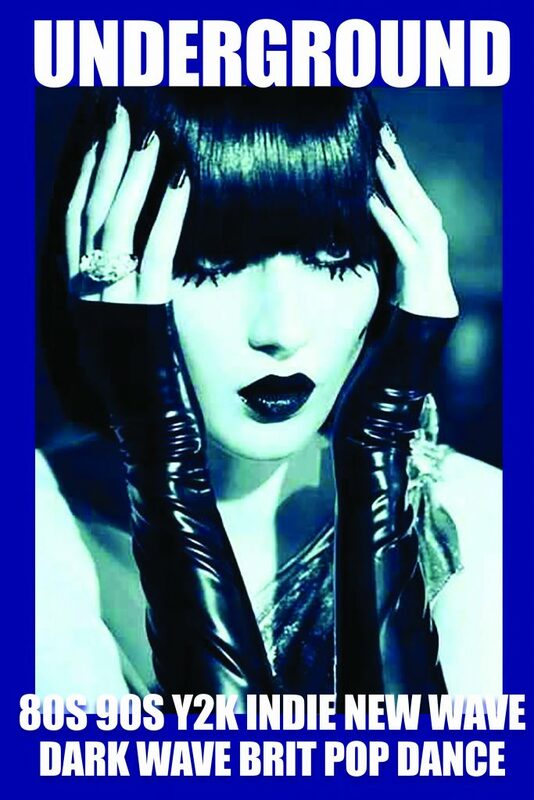 We got Guest DJ Xian Vox (LADEAD) taking over the Upstairs to bring you the sounds of Dark Indie • Goth • Synthpop • Darkwave • Dark 80s • Industrial. Meanwhile on the Main level, resident DJ Larry G. (Lawrence Gjurgevich) will deliver your favorite Indie • Britpop • Post-Punk • Alternative • Rock ‘n’ Roll • Eighties • Electroclash • New Wave. Be there. UNDERGROUND VS L A D E A D!!! Adult., The Smiths, Interpol, Joy Division, Wolfsheim, IAMX, Bauhaus, Depeche Mode, The Cure, TR/ST, Pulp, Yeah Yeah Yeahs, Front 242, Ladytron, De/Vision, New Order, Blur, Suede, The Faint, Vitalic, Elastica, She Wants Revenge, Talking Heads, HEALTH, Soft Cell, Suede, Gang of Four, Crystal Castles, The Editors, The Jam, The Soft Moon, And One, Pet Shop Boys, Trentmoeller, Devo, Nitzer Ebb, David Bowie, Siouxsie & The Banshees, Wire, Lush, Iamamiwhoami, Saint Etienne, VNV Nation, Blondie, Oasis, OMD, The Strokes, Peaches, The Presets, Bloc Party, MS MR, Skinny Puppy, Miss Kittin & More!!! 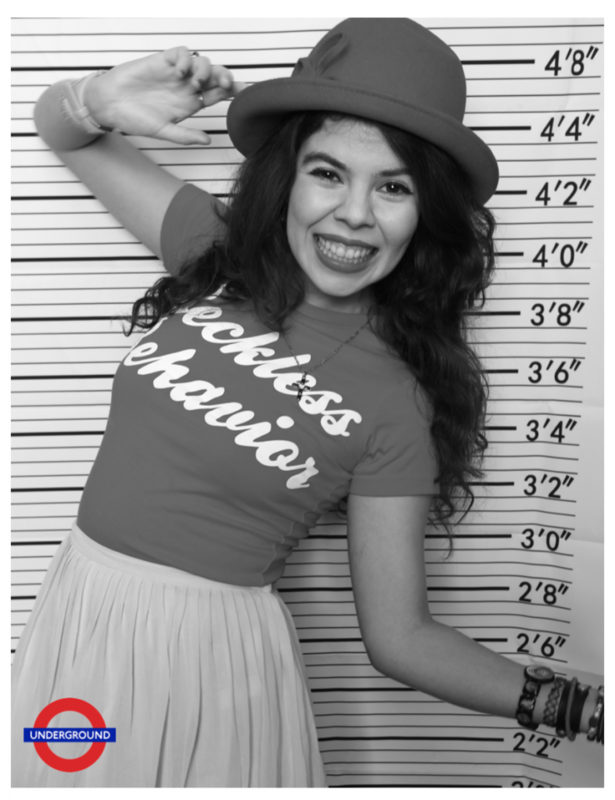 Your mugshots are up & ready for you. Suitable for framing courtesy of Matador y Toros and Club Underground.